We continue our Presidential Geography series, a one-by-one examination of each state’s political landscape and how it’s changing. Here is a look at Colorado, the Centennial State. FiveThirtyEight spoke with Peter Hanson and Seth Masket, two professors of political science at the University of Denver, and Kyle L. Saunders, an associate professor of political science at Colorado State University. Colorado, the host state of the first presidential debate on Wednesday night, is a fitting platform for President Obama and Mitt Romney to begin making their closing pitch to voters. Colorado is a persuadable state, with a relatively balanced partisan split and a large number of swing voters. Moreover, if the debates represent Mr. Romney’s last, best chance at a comeback, Colorado and the West may present the most likely starting point. Mr. Obama’s standing, compared to 2008, has appeared to deteriorate more in the West — specifically the Mountain West — than in other regions. That shift is evident in Colorado, although Mr. Obama has maintained a narrow lead in surveys there. 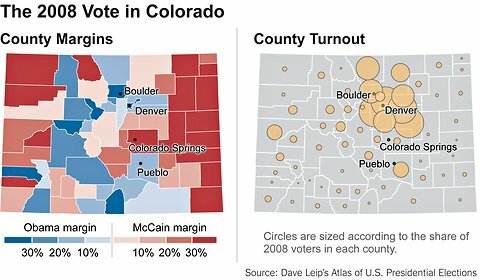 But the fact that Colorado is a political battleground at all is a recent development. It was a reliably Republican state just 10 years ago, having favored G.O.P. presidential candidates in every election but two — 1964 and 1992 — since 1950. In 2000, Al Gore won the national popular vote, but George W. Bush easily carried Colorado. In 2002, Republicans held the governorship, the state’s two United States Senate seats, five of Colorado’s seven seats in the United States Congress, as well as majorities in the Colorado State Senate and Statehouse. But fast-forward six years, and everything had been reversed. Democrats held both Senate seats, five United States Congressional seats, and majorities in both houses of the Colorado legislature. Republicans were left with only two House seats, exactly what Democrats had been clinging to in 2002. The Colorado political landscape had been remade, and swiftly, by a rapidly growing Hispanic population and an influx of young, highly educated migrants from the West Coast, particularly California. Colorado is now 21 percent Hispanic as well as one of the youngest and best educated states. Almost a quarter of 2008 voters had completed at least a year of postgraduate study, according to exit polls. In 2010, Republicans gained back some of that lost territory, and the political balance in Colorado now sits between its 2002 and 2008 extremes. About 80 percent of Colorado residents live in cities, suburbs and small towns along the Front Range, from Greeley and Fort Collins south to Boulder, Denver, Colorado Springs and Pueblo. Denver, the northern Denver suburbs in Adams County and Boulder form the bedrock of Democratic support in Colorado. Denver is young, single and liberal. It’s a diverse city, at 31 percent Hispanic and 10 percent black. Adams County is 38 percent Hispanic. Boulder County is mostly white but just as liberal as Denver. Boulder is home to the University of Colorado and a vibrant tech industry. Democrats also tend to prevail in heavily Hispanic Pueblo County, although by smaller margins than in Denver and Boulder counties. Between Denver and Pueblo is the Republican base of support. Colorado Springs is both fiscally and socially conservative, home to Focus on the Family and a large share of evangelical Christians as well as Fort Carson and Peterson Air Force Base. Republicans are also strong in the outer ring of Denver suburbs. The communities south of Denver and north of Colorado Springs — in affluent and culturally conservative Douglas County — are solidly Republican. With a few exceptions — ski resort towns like Aspen and Telluride and heavily Hispanic central and southern counties — the rest of Colorado is rural, dotted by ranches and Republicans. The western slope of the Rocky Mountains and the eastern plains (everything east of the Front Range) are both conservative but in a classic, western, libertarian way. Arapahoe County and Jefferson County are part of the inner ring of the Denver suburbs. 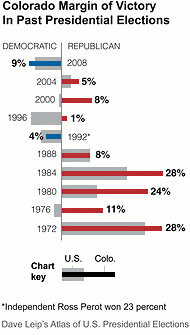 This is where the political effects of Colorado’s changing demographic have been most evident. George W. Bush carried both counties in 2000 and 2004, but Mr. Obama carried them in 2008.
h counties are good barometers of the statewide vote, but Jefferson County has been perfect in each of the past three presidential elections. Jefferson County is full of working-class suburbs, a pivotal voting group. Mr. Obama is a 75 percent favorite in Colorado, according to the current FiveThirtyEight forecast. That’s lower than his odds of winning re-election all together. Despite the fact that Mr. Obama overperformed in Colorado in 2008 relative to the nation, he seems to have lost more ground there than in other, seemingly less hospitable battleground states. That shift is indicative of the entire region. Comparing the 2008 exit polls with the regional breakdown of Gallup’s national tracking poll, it becomes clear that Mr. Obama’s popularity has taken a disproportionate hit in the West. What happened? To begin with, battleground states in the Mountain West are elastic. That is, Colorado and Nevada have an above average share of swing voters, and they tend to respond to the national political environment. And Mr. Obama had a much more favorable wind in 2008. 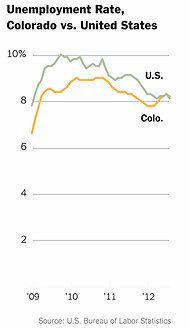 The economic recovery has been particularly anemic in Mountain West battleground states. Colorado and Nevada are still suffering with unemployment rates above the national average; Nevada’s is 12.1 percent, and Colorado’s is 8.2 percent. Still, even if the Mountain West is a good region for Mr. Romney to begin a comeback, he would need to carry swing states in other regions to win the White House. Colorado has nine electoral votes, and Nevada has just six.